For a small country Ireland sure has had its fair share of maritime heroes. From inspirational legends and genuine innovators like intrepid adventurers Ernest Shackleton and Tom Crean, game-changing inventors like John Philip Holland to selfless captains like John McNeil Boyd, we’ve been lucky to be gifted with many of those who fear little and dream big. But in truth not every Irish maritime legend is a hero, nor every hero a role model to be lauded. And Irish-born pirate Anne Bonny is one of those that most likely you would not hold up to your children as a paragon of virtue to be imitiated and admired. Because in known fact she was a notorious, dangerous and feared pirate. But through her life and adventures she would become an icon in the golden age of piracy and a Irish maritime legend nonetheless. Born in Cork on March 8th 1702, she was the illegitimate daughter of William McCormac, a successful lawyer and his maid Mary Brennan. 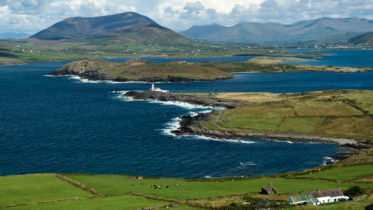 Her father separated from his wife soon after she found out about his infidelity and the trio left Ireland in disgrace. They traveled to Charleston South Carolina where her father amassed a substantial fortune through a profitable merchant business and bought a plantation. Record of her early years are patchy. Some allude to a fiery temper. One story goes that when she was thirteen she stabbed a servant who angered her with a kitchen knife. But records from the time are patchy and we’re reticent to bind an Irishwoman we’ve already decided deserves to be in the pantheon of Irish greats with such low talk, to bear so we ignore such louche insinuations. Her father betrothed her to a local man but Anne refused to go ahead with the arrangement and against her father’s wishes married a sailor and small time pirate John Bonny. Outraged by his daughter’s decision he disowned her. With nothing for them in Charleston any more the couple moved to island of New Providence in the Bahamas, known as the Pirates Republic. But it was an unhappy marriage, Anne grew to dislike her spineless husband, who had become an informant for privateer Woodes Rogers, the governor of Bahamas. She frequented sought the company of other men and crossed paths with Calico Jack Rackham. They became involved and Calico Jack offered to pay off John Bonny to divorce his wife, but he refused. So the pirates fled in the night and Anne became his lover and first mate and together the pirated merchant vessels along the coast of Jamaica. At the time it was considered bad luck to have a woman aboard a ship, but Anne could hold her own did not conceal her gender to the rest of the crew. She was just as fierce and fearless in battle as the rest of the crew. 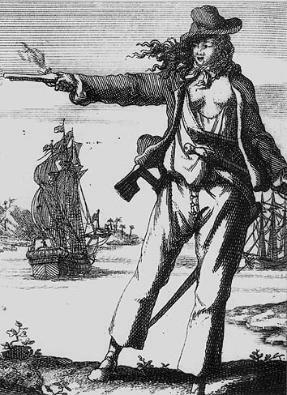 In 1720 another women Mary Read joined the crew. She was disguised as a man and only Bonny and Calico knew the truth. 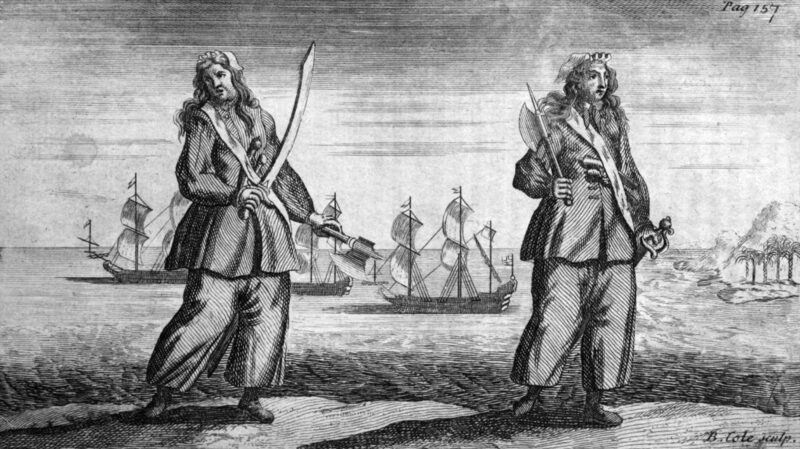 The pair became two most famed female pirates of all time. Their tyrannical days came to an end in October 1720 when Rogers, the governor of the Bahamas, sent privateer Captain Jonathan Barnet in pursuit. Bonny and Read valiantly fought off their assailants, the rest of the crew were too drunk to put up much resistance. But it was for naught and they were captured and found guilty, sentenced to hang. Anne blamed Calico Jack for their capture and her last words to him in prison before he was sent to the gallows were “Sorry to see you there, but if you’d fought like a man, you would not have been hanged like a dog”. Bonny and Read were tried separately and found guilty. They were both however pregnant and this won them a stay of execution. Mary Read died from fever in jail a year later, and Anne was released, possibly under her father’s influence and returned home to live out her life under an assumed name.